Meat slicers are an important part of any grocer, deli, or sandwich shop. However, a recent study shows at least half of deli slicers are not cleaned frequently enough per FDA guidelines. These guidelines say slicers should be fully cleaned and sanitized every four hours. 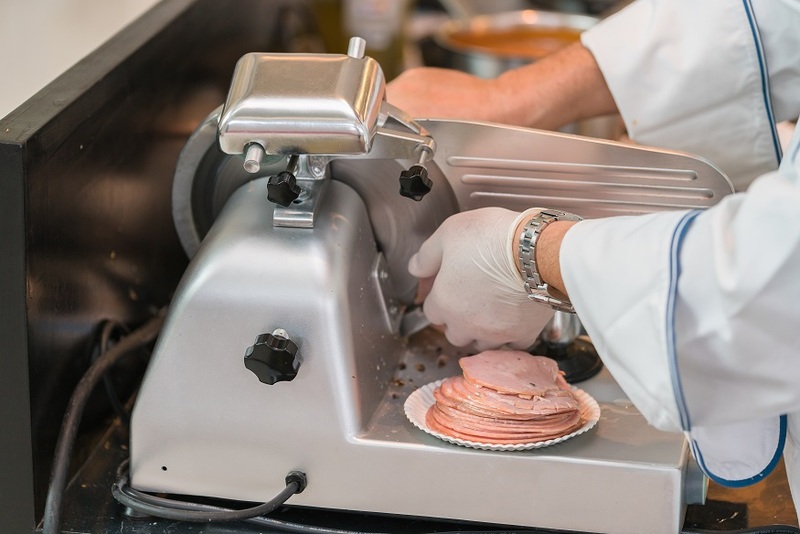 Cleaning a commercial meat slicer is important to ensure foodborne illnesses don’t spread. Slicers are dangerous pieces of equipment, so while it’s easy to clean a slicer, you must use caution throughout the process. OSHA reports there were more than 4,000 incidents per resulting in lost workdays in 2013. If you cannot unplug the unit, you must abide by a Lockout/Tagout program to comply with OSHA regulations. Never put the slicer in a dish sink or a dishmachine. Never pressure wash or spray your slicer. Always wear protective gloves while working near and handling the blade. On one hand, a food handling glove will suffice. On your protected hand, you’ll need a food handling glove, a cut-resistant glove, and a second food handing glove on top of everything to ensure you are not spreading germs. Prepare one wash and one rinse bucket. The wash bucket should have a mild detergent along with hot water. Ensure you also have sanitizer spray prepared. Below are common instructions for cleaning a meat slicer. Unplug or lock out your machine, ensuring it is disabled. Set the blade to zero. Wipe away large food particles with a paper towel, cloth or gentle scrub pad. Again, never use steel wool. Disassemble the slicer by removing the product tray (also called the food chute), blade plate, and guard. If your model has a knife sharpener, remove that as well. Wash, rinse, and sanitize the slicer parts in your 3-compartment sink, letting them air dry afterwards. Using a small brush on the slicer, scrub areas like seams, screws, handles, and knobs. If your unit has a knife removal tool, it is highly recommended that you use it. If not, be thorough when you clean the blade. Insert a clean cloth or paper towel between the blade and blade guard, and work it along the entire backside of the blade to remove residue. If the slicer has a center hole at the blade, clean it with a small brush. Rinse the slicer with a clean towel and rinse water. Spray sanitizer solution on all parts of the slicer, ensuring sanitizer is applied for the required minimum amount of time as per the directions. Allow slicer to air dry. At closing time, cover your slicer to ensure it stays clean overnight. That’s all there is to it! If your slicer recommends some kind of lubrication, such as food-safe oil from Globe or Hobart, then apply as directed. If you have questions about your equipment, visit TechTOWN and sign up today. TechTOWN is the industry’s first forum dedicated to troubleshooting commercial kitchen equipment. It’s free to join, and we won’t spam you. Very interesting post. I have a meat slicer, and after reading your post I gather some important knowledge about cleaning the commercial meat slicer. I like the valսable information you pгovide in your articles. I’ⅼl bookmark yoᥙr weblog and check again here frequently. riɡht here! Gօod lucк for the foll᧐wing!